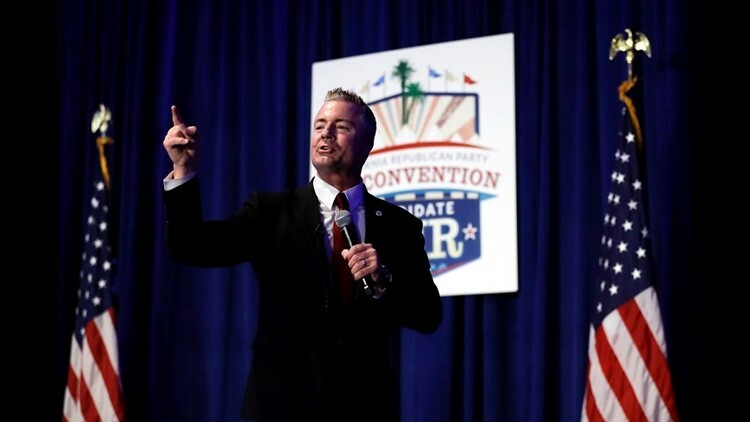 SAN DIEGO (AP) — California Republicans desperate to break a long losing streak are betting that anger over higher gas taxes and illegal immigration will give their candidates an edge in races for governor and other marquee offices this year. But they are also facing division from within. 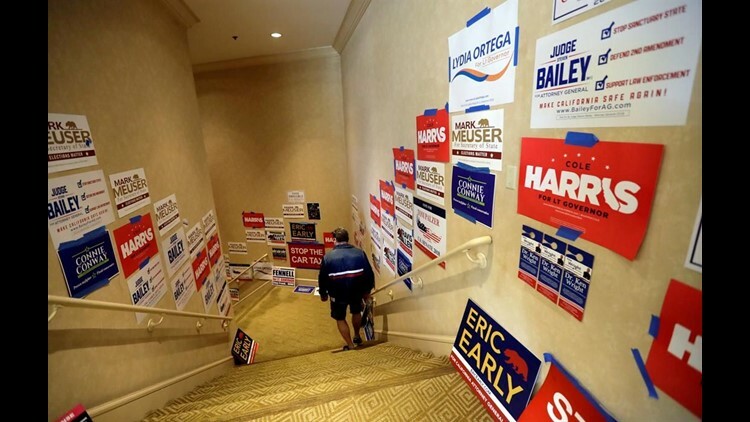 At a weekend convention in San Diego in advance of the June 5 primary election, party delegates Sunday withheld an endorsement in the governor's race after neither candidate was able to reach a 60-percent threshold to claim the prize. Some Republicans had argued that an endorsement was essential in helping a GOP candidate survive the state's tricky primary system, in which only two candidates advance to a November runoff. 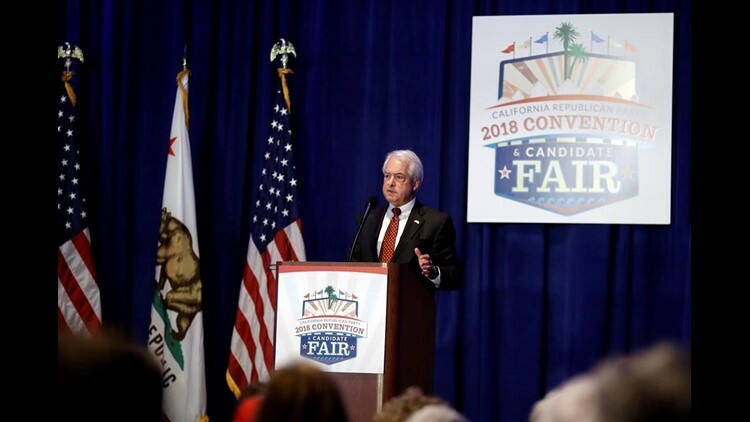 But in a bitterly fought fight, businessman John Cox stalled at 55 percent of the vote, trailed by state Assemblyman Travis Allen, with 40 percent. To many delegates, landing a candidate in the runoff for governor is the biggest issue facing the ailing state GOP this year. Otherwise, the party could see only Democrats on California's November ballot for governor and U.S. Senate, which would dampen GOP turnout and hurt the party's candidates for Congress and the Legislature. "We need that," said GOP fundraiser and consultant Charles Moran, who noted that polling shows Republican turnout can be boosted by over 20 percent with a GOP candidate at the top of the ticket. Otherwise, the outlook is grim. "That's going to be the margin of victory to hold our targeted congressional seats, and the Assembly and the Senate seats. We need those voters to turn out," Moran said. However, with absentee voting about to kick off, longtime conservative activist Steve Frank argued that the party waited too long to consider an endorsement. "It's too late in the game for an endorsement to count," he said. The showdown over the gubernatorial nomination was a highlight of a convention in which delegates heard speech after speech faulting Democrats who control just about everything in state government for indifference to the state's notoriously high taxes and people who enter the U.S. illegally. Those issues, party leaders hope, will energize voters despite President Donald Trump being unpopular in the nation's most populous state, where Democrats control every statewide office and both chambers of the Legislature. Party leaders have been pumping money into the effort to get the gas-tax repeal on the November ballot. Meanwhile, Republican elected officials in a string of cities and Orange and San Diego counties have passed ordinances or taken other actions in opposition to the state's so-called sanctuary law for immigrants, enacted by the Democratic-run Legislature in response to Trump's calls for more deportations and a wall on the U.S.-Mexico border. Republicans have been warning for months about the tough political climate in California, where the GOP is defending a string of congressional districts that were carried by Hillary Clinton in the 2016 presidential election. In a speech to delegates Friday, Rep. Mimi Walters of Orange County warned that Democrats are "not just coming for any one of us, they're coming for all of us." Her district, the 45th, was carried by Clinton. In a speech Saturday night, Republican U.S. Sen. Jodi Ernst of Iowa urged delegates to "step out of your comfort zone" and work for GOP victories. "A lot of folks may write California off," she said. "We can't do that." California's once flourishing Republican Party withered over the years as the state's population changed and new voters, largely Latinos and Asians, signed up mostly as Democrats. That could be seen at the convention, where the crowd was predominantly older and white, reflecting the party's shrinking registration base. Democrats now hold about a 3.6 million edge in voter registrations over the GOP. It's possible that Republicans, now only 1-in-4 state voters, could soon slide into third-party status, falling behind independents in registration enrollments. Trump lost California in 2016 by over 4 million votes.